Wine, nibbles & an opportunity to meet some of the gallery artists & find some imaginative gift ideas for Christmas. New collections of original paintings, limited edition prints, photographs plus handmade glass, ceramics, jewellery, sculptures & cards. Sterling silver jewellery - earrings, bracelets, necklaces, even cufflinks. Very affordable, with earrings starting at just £6 a pair. Great idea if you need to send a present by post. For animal lovers there are superb bronze resin sculptures by Cornish artist, Suzie Marsh. Playful cats, hares, elephants, meerkats, bears, mice, ducks to name a few. The choice of handmade ceramics includes quirky clocks by Iveta Goddard, beautiful bowls by Jill Ford & Rob Dunster & Sally Woodford's highly creative Raku fired pieces. With prices starting at £14 they won't break the bank. 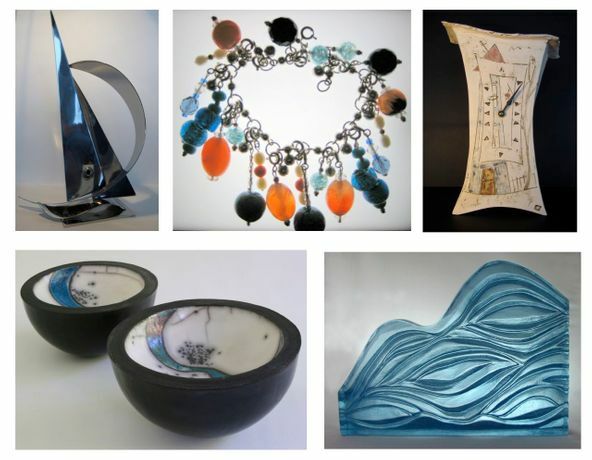 Lovers of the sea & sailing are well catered for, there are stunning stainless steel yacht sculptures, little Raku fired 3D ceramic boats, dramatic photographic prints of racing yachts as well as original coastal inspired paintings by Leila Godden from just £89. Bob Aylott's much admired & extensive range of photographs of the local area are sure to be a hit. Mike Topham's innovative handmade wire 3D pictures will definitely make you smile. For something really special & unique one of Adriana Brinsmead-Stockham's cast glass sculptures would make a sensational gift. Glass coasters & dishes by Loose Designs are affordable & colourful. So come & enjoy a glass of wine & at the same time see an inspirational selection of artworks which may just resolve your gift buying dilemmas. Why not shop & party at the same time - lets make shopping fun not a chore.